It's funny, Maybin is a hugely important figure in Tigers history but until tonight had just 53 PA with the team. Maybin, of course, was one of the two centerpieces in the Miguel Cabrera trade that brought the future Hall of Famer to the Motor City. When the Tigers brought Maybin back this winter, there was a sense of homecoming for everyone even though he was about to turn 29 and had parts of eight other seasons in the show with three different organizations. Maybin had one really good season in 2011, but fell short of his prospect promise in every other year of his career. There were injuries and growing pains along the way, but by any real accounting of his performance, things had gone poorly. He made it to the majors, earned a nice payday, and stuck so it would be hard to call him a bust, but he did not grow into the player that people expected when he was paired with Andrew Miller in a trade for one of the generation’s true stars. Maybin was an above-average hitter in 2011 with good center field defense and great base running, but his bat suffered in 2012 and he couldn’t stay consistently healthy for the next two seasons. When he got to Atlanta last year, the defense and base running of his youth were less impressive and it became clear that if he was going to have a career into his 30s he was going to need more from his bat. You can be a below average hitter if you are a really good defender or a terrific base runner, but with Maybin’s age and injury history conspiring against him, it looked more and more like any future value was going to come from his bat or not come at all. This isn’t to say Maybin can’t run or field, but rather that he’s no longer someone who can do either well enough to carry a lackluster bat. Fortunately, Maybin’s bat showed signs of life last season and that positive progress has carried over into 2016. We’re only halfway into 2016 and he’s only 49 games deep, but this is Maybin’s best offensive season to date by a significant margin. Of course, it’s 49 games and he has a .399 BABIP, but we’ll get to that. 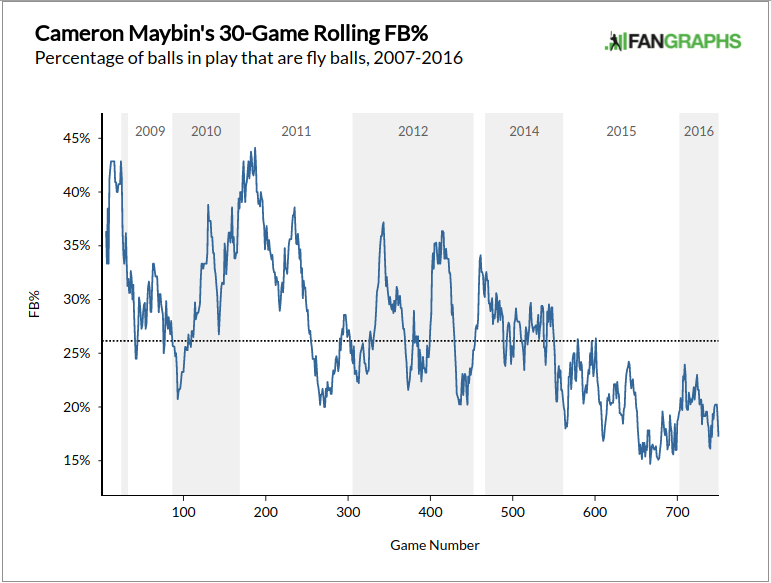 Maybin is walking more than ever, striking out at a career low rate, and getting on base more often than ever. In fact, even if you deduct 10 hits to pull his BABIP down to .330 this year, he’s still running a .340+ OBP. In other words, Maybin’s certainly getting help from a BABIP that won’t stay quite that high going forward, but it’s not that strange that he’s running a higher BABIP this year given a very important shift in his approach. Braves hitting coach Kevin Seitzer is a believer in cutting down on strikeouts and chasing singles, and Maybin says that Seitzer really influenced his approach last year. As you can see in chart below, Maybin has really cut down on the number of balls he’s hit in the air, instead working on ground balls and line drives. An approach like that will deplete your extra base hits, but grounders and line drives fall for hits more often than fly balls. Across the league, power is typically worth the contact trade off because of the value of extra bases, but Maybin individually seems to have found balance as a singles hitter. Trading contact for power works in the aggregate, but it doesn’t work for everyone. 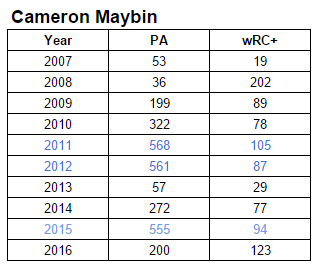 This is a rough comparison, but look at Maybin from his debut through 2012 (before the two injury plagued years) and then from 2015-2016 after the Seitzer intervention. Keep in mind the offensive era changed a good bit over the course of this period, but the line features more walks, fewer strikeouts, and less power over the last two years and the drop in fly ball rate is really noticeable. This is a different hitter. For now, it’s good different. I’m certainly not going to look at two months of Maybin and suggest he’s suddenly become a true talent .390 BABIP hitter or that he’s going to maintain his 123 wRC+ for the remainder of the year, but I think it’s safe to say the version of Maybin we saw in Miami and San Diego no longer exists. At the moment, he’s playing at somewhere between a 3-4 WAR pace. Even if he’s not quite that level of player for the rest of the year, he’s probably an average regular the Tigers acquired for virtually nothing this offseason and can keep around for 2017. This is especially important considering another rough year for Anthony Gose (and perhaps an impending release) and a complete absence of other outfielders within the system near major league ready. After all the Tigers are using Andrew Romine and Mike Aviles in the outfield regularly this year while JD Martinez heals and they continue to not know if Steven Moya exists. The Tigers have essentially no one in the organization who’s a good option in center field. JaCoby Jones is relatively new to the spot and needs seasoning all-around. Derek Hill is miles away with the bat. It’s Cameron Maybin in CF or it’s Andrew Romine, so it’s awfully nice to see Maybin’s development into a productive hitter. Some of the performance is good fortune, but some of it does appear to be the result of a new approach. We are hearing more and more criticism of the game these days from old school former players turned commentators or analysts who decry the fact that hitters don’t care about striking out anymore and are constantly trying to hit home runs. Having Cameron Maybin come in and get on base a lot instead of striking out is almost a throwback type approach. As Jim Price always says, ‘if you put the ball in play then good things can happen’ and I think Maybin has been proof of that since his return from the DL. Also, having your only real speed guy on base is what you always want.